Jess Jackson has added three more California names to Jackson Family Wines' rapidly growing portfolio. The buying spree continues. 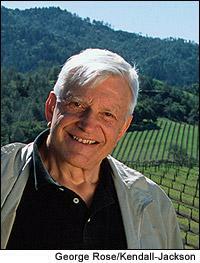 Less than two months after Kendall-Jackson founder Jess Jackson purchased both the Robert Pecota winery in Napa and Murphy-Goode in Sonoma, Jackson Family Wines has made a successful $97 million bid for Legacy Estates Group, which owns three California wineries: Freemark Abbey in Napa Valley, Arrowood in Sonoma County and Byron in Santa Barbara County. Jackson Family Wines beat out a bid by a FAB Acquisition Co., a partnership between Bill Price, who is a founding partner of the Texas Pacific Group, and the Huneeus family, which owns Quintessa winery in Napa. The sale includes the winery facilities, brands, existing inventory and roughly 200 acres of vineyards, most of which are near Byron, in California's Central Coast. "We think each of these wineries has a bright future," said Clay Gregory, president of Jackson Family Wines, which is co-owned by Jackson and his wife, Barbara Banke. "The Byron winery is very nice, and it's a new facility, and the vineyards are adjacent our Cambria property. Freemark Abbey has a great location on Highway 29 in Napa, and there's a real legacy there that's worth reviving. Arrowood is a well-established brand with a strong following." Legacy filed for Chapter 11 bankruptcy in November 2005, just eight months after it paid $40 million to buy Arrowood and Byron from Constellation Brands. At the time, Legacy CFO Dave Henriksen said that the integration of the companies hadn't gone as smoothly as hoped, causing them to default on debt payments. Henricksen said that the filing was simply a refinancing effort, and that there were no plans to sell any of Legacy's properties. Jackson made his bid on Aug. 16, toward the end of an auction in bankruptcy court in Santa Rosa, Calif., topping FAB's bid of $94 million. However, Jackson wasn't initially declared the winner because Legacy had an existing long-term contract with distributor Wilson Daniels; Jackson Family Wines' acquisition was contingent upon coming to an agreement with Wilson Daniels by the end of Friday. If the two parties hadn't, FAB's bid would have been selected as the winner, since, as part of its offer, it promised to honor the Wilson Daniels contract. Gregory would not comment on the deal with Wilson Daniels, saying only, "We were able to work out something that both parties were happy with." Legacy was founded in 2000 by brothers Calvin and Dev Sidhu. They bought Freemark Abbey in 2001, and borrowed the money from a hedge fund to acquire Arrowood and Byron in 2005. It's unclear what staffing changes, if any, will be made, Gregory said. Winemaker Richard Arrowood, who has remained on board his namesake winery through the transition in owners from Mondavi to Constellation to Legacy, was not available for comment on Friday. "Our usual goal when we buy a winery is to keep there people there, but we have not yet addressed it," Gregory said. As part of Jackson's Artisan & Estates division, the wineries will operate independently, Gregory said, using their own vineyards, winemaking teams and marketing.